The Tiger Deluxe Corner Shed is an ideal storage solution that can be easily tucked away into the corner of your garden. 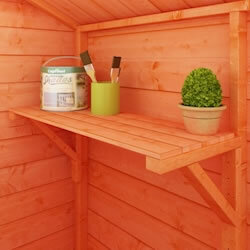 Brilliantly designed, this corner shed is made to fit perfectly into any corner of your garden. Very happy with my shed, arrived on time, very sturdy and good value. The shed was ordered on !7/09/18 and delivered 04/10/18 - excellent service & we were advised at each stage what was going on. Delivery driver arrived about 5 minutes before scheduled time and was friendly and very helpful. As a family this is the third Tiger product we have purchased (eldest son purchased 7 x 5 pent shed & youngest son a 6 x 5 bike shed). All have been really well constructed from good quality wood and were complete with all nails & felt etc. that was needed. 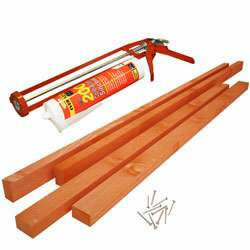 I have no hesitation in recommending Tiger products - excellent quality at a good price. Looks well made and was easy to assemble. 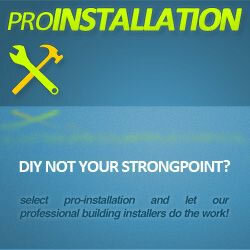 As usual great build quality easy to erect looking forward to our second cabin coming now. 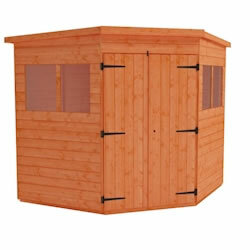 The Tiger Deluxe Corner Shed is an ideal storage solution that can be easily tucked away into the corner of your garden. 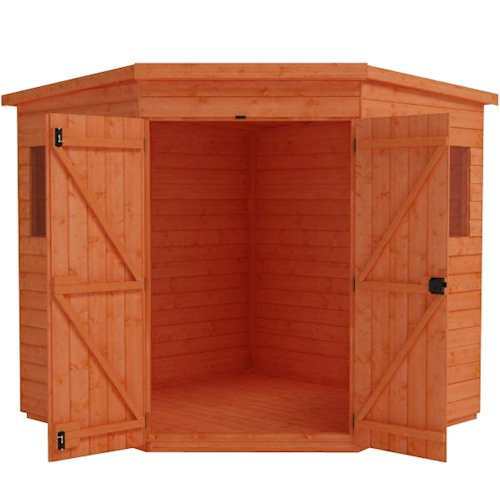 Brilliantly designed, this corner shed is made to fit perfectly into any corner of your garden. With securely hung extra large double doors supplied (including a secure lock and key system), access to the shed is made incredibly easy. 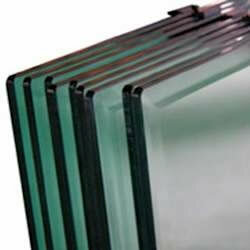 Strength and security is key with strong t-hinges supporting the large well braced double doors. 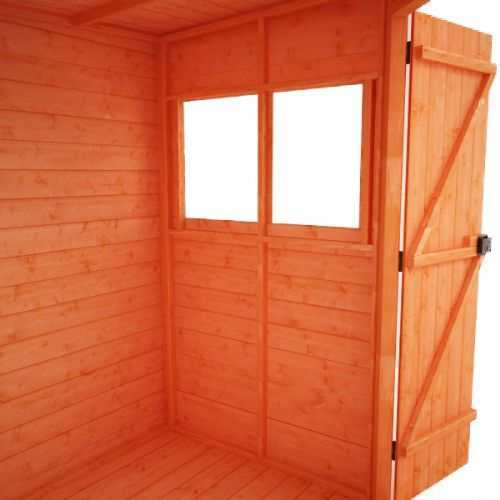 The Tiger Deluxe Corner Shed is built to last from the high grade 12mm finish shiplap tongue and groove cladding. Manufactured using only the highest quality European softwoods available, you can be rest assured that this building will last for years to come. 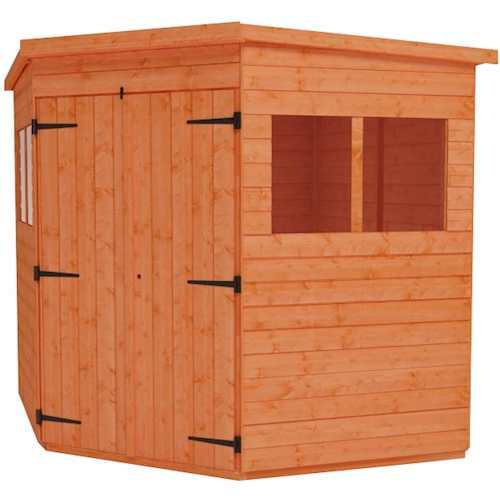 This corner shed comes complete with a ten year guarantee on the timber. Unlike many budget competitor products this garden corner shed is built with only the highest quality materials and many garden buildings in the market simply cannot compare! THIS garden corner shed is clad with high grade 12mm finish shiplap tongue and groove cladding – beware of corner sheds that feature poorly finished rough edged boards milled out of inferior timber often with a thinner finish. 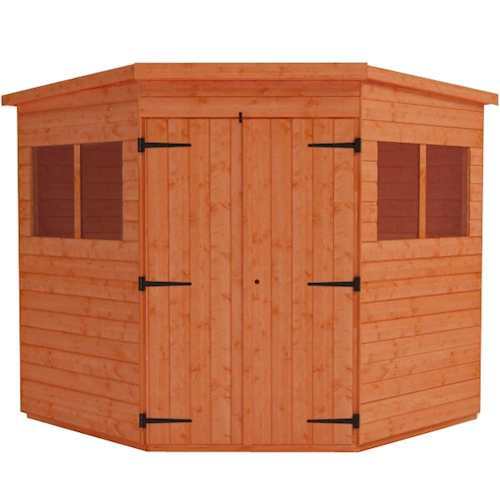 THIS garden corner shed features heavyweight ‘rounded 4 corner’ 28x44mm finish framework throughout giving it the strength to last – beware of corner sheds that use rough sawn ‘matchstick thin’ framework that barely hold the shed together. 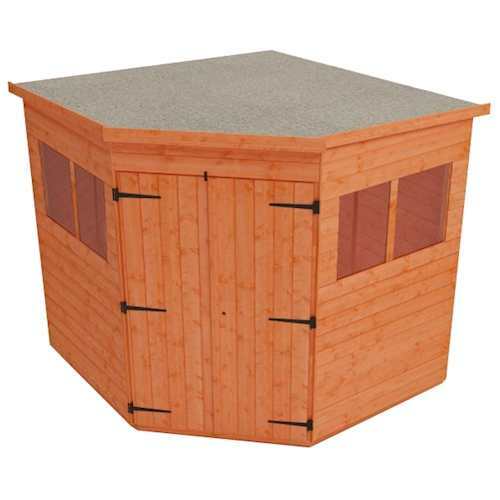 THIS garden corner shed features thick tongue and grooved floorboard in the floor and roof sections and contains NO cheap sheet materials such as OSB or chipboard – beware of corner sheds that use single piece OSB / chipboard roofs that offer little protection in the areas where you need it most. THIS garden corner shed retains our extra high ridge height – beware of corner sheds that are incredibly low making it difficult to stand up inside. 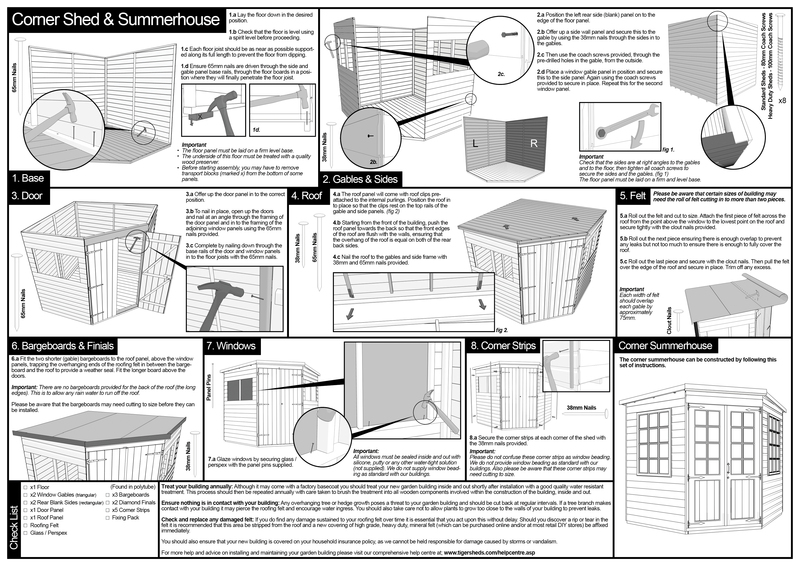 It is essential that this garden corner shed is assembled strictly in accordance with the instructions supplied on a firm and level base constructed from a suitably durable material. The garden shed should also be treated shortly after assembly and then annually thereafter with an appropriate high quality preservative and all glazing units must be sealed, inside and out, with silicone or other water tight sealant.